Micron introduced a mSATA version of its RealSSD C400, a new disk that measures just 30mm x 51mm. The new SSD features the SATA 6Gbps Marvell 9174 controller and is available in 32GB, 64GB, 128GB and 256GB capacities. The latter one is the fastest model, it offers read speeds as high as 500MB/s, write speeds of up to 260MB/s, and 4k random write performance of 50,000 IOPS. Micron Technology, Inc. (Nasdaq:MU), one of the world's leading providers of advanced semiconductor solutions, today announced a new solid-state drive (SSD) that broadens Micron's client product portfolio to serve the rapidly emerging Ultrabook™ category. The newly announced drive is based on the proven architecture of Micron's popular RealSSD™ C400 drives, providing the same high performance and reliability. The C400 mSATA drive is designed to work in ultrathin, high-performance SSD-based systems and can also act as a cache drive in dual-drive systems. SSD-caching systems have both a hard-disk drive and a low-capacity SSD. These systems use software to automatically identify the most frequently used files and programs and then access those files from the SSD, providing greater performance than a hard-disk drive, but at a lower price point than a stand-alone SSD. 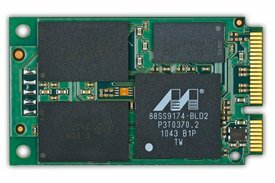 The mSATA form factor is an emerging standard that allows ultrathin notebook manufacturers to integrate a high-capacity SSD in a space that is about one-third of the size of a standard business card (3cm x 5cm). That tiny footprint, coupled with the C400's inherent power savings, light weight, and durability, make this drive ideal for new mobile designs. "Efficient memory and storage are key components to portable computing," said Justin Sykes, Micron's general manager of client SSD solutions. "Our new mSATA delivers on the true promise of SSD technology — high-performance storage in a tiny, low-power package. Breaking away from the constraints of enclosures meant for hard drives is a great step toward enabling truly mobile computing platforms." The RealSSD C400 mSATA SSD ships in capacities ranging from 32 gigabytes (GB) to 256GB with a SATA 6 gigabits per second (Gb/s) interface for the high data throughput that is ideal for the "instant on" responsiveness demanded by Ultrabook systems. The drive's focused high performance, low power consumption and caseless design enable better computing experiences in ultrathin form factors. Additionally, the established design leverages Micron's proven 25 nanometer (nm) MLC NAND Flash and manufacturing and testing capabilities. The drive is currently in production and is available through Micron's extensive distribution network. A Crucial-branded version will be available to consumers this calendar quarter through select global channel partners and at www.crucial.com.